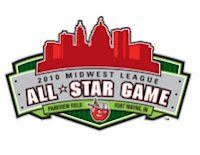 Bowling Green, KY – The Bowling Green Hot Rods, Class A Affiliate of the Tampa Bay Rays, announced on Tuesday that outfielder Chris Murrill and pitchers Alexander Colome and Wilking Rodriguez have been named to the 2010 Midwest League All-Star Game. The trio will play for the Eastern Division on June 22 at Parkview Field in Fort Wayne, Indiana. Murrill will be in the starting line-up, manning one of three outfield spots for the Eastern Division. The Mobile, Alabama native leads the Hot Rods with a .312 batting average and 62 hits, numbers that rank 11th in the Midwest League. He has also stolen 21 bases, 4th-most in the MWL. He currently leads the Hot Rods in runs (33), OBP (.374), and total bases (84) while ranking second on the team with three triples and ten doubles. This is the first all-star selection for Murrill after narrowly missing an all-star nod with Hudson Valley in the New York-Penn League in 2009. Colome and Rodriguez lead the Hot Rods in most important pitching categories and are both ranked by Baseball America among the Top 30 Prospects in the Rays’ organization. Colome is 4-4 with a 2.52 ERA and earns his second all-star berth after making the mid-season team with Hudson Valley a year ago. A right-hander from the Dominican Republic, Colome has spent a majority of the season among the league leaders in ERA, WHIP (1.04), and strikeouts. He has pitched 60.2 innings and recorded 61 strikeouts, averaging a strikeout per inning in 2010. Opposing batters are hitting just .196 against him, the fifth-lowest batting average among pitchers in the MWL. Rodriguez has also recorded four wins through his first 11 starts, picking up his latest victory on Sunday afternoon against the Kane County Cougars. He has thrown a team-high 64 innings, recording a 3.52 ERA in just his second season pitching in the United States. The 20-year-old Venezuelan leads the Hot Rods with 62 strikeouts, seventh-most in the league. Like Colome, he has been stingy on base-runners, allowing just 1.14 walks and hits per inning (WHIP). He has walked just 13 batters, lowest among any starter on the team.